THE PLACE: The Old Fashioned Tavern & Restaurant, because it’s a day and I’m alive, so I’m here. WHAT IS IT? It’s today’s Farmer’s Market brunch cocktail. 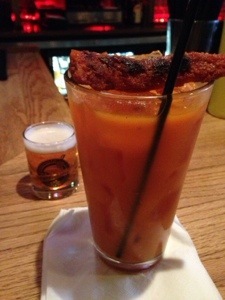 Essentially a Bloody Mary made with carrot juice. WHAT’S IN IT? Let’s start with the booze: house-infused Serrano pepper vodka. The peppers are from Savory Accents. I’m not sure what kind of vodka it is. Hold on, I’ll ask Casey. [asking Casey] She doesn’t know. Might be Smirnoff. Doesn’t matter. It’s spicy. WHAT ELSE IS IN IT? Carrots, pearl onions, and ramps from Harmony Valley, poblano peppers from Savory Accents, honey from the Bee Charmer, and Mandy’s Hot Sauce. Oh, and it appears to be topped with a roasted carrot. ARE YOU SURE? I am now. The woman sitting to my right demanded that I taste it. It’s a carrot, all right. Yep. NO TOMATOES? Not a one. HOW IS IT? It’s pretty fantastic. The carrot juice is quite sweet, but not cloying. (Love that word. Such a perfect restaurant review word, cloying. So pompous.) very spicy, almost but not quite too spicy. Almost. And it’s full of the vitamins that my poor hungover body needs. DEEP THOUGHTS: Honestly, this doesn’t much resemble a traditional Bloody Mary. No tomatoes, of course, but also minimal garnish and no pickled elements. I have no problem with that. It’s delicious and refreshing and it’s exactly what I need right now. I may have overdone things last night.